Endowed with a 172-year-old watchmaking heritage, Baume & Mercier allies tradition and modernity to perfection. The initial watchmaking house named "Freres Baume" was created in 1830 by the Baume brothers in Les Bois, a village in the Swiss Jura. "Freres Baume" timepieces were rapidly distinguished for their quality and reliability. "Accept only perfection, only manufacture watches of the highest quality", such was the maxim of the two brand founders and brothers, Louis-Victor and Joseph-Celestin Baume. In 1920, third generation William Baume, a man of tradition and discipline formed a partnership with Paul Mercier, a creative man doted with exceptional business acumen. Together they created Baume & Mercier and established the company's headquarters in Geneva. The brand met with immediate worldwide success, never ceasing to astound with innovative and distinctive personality products. In 1921, the company was recompensed with the supreme watchmaking distinction, the Poinçon de Geneve, awarded by the Chamber of Commerce & Industry of Geneva. In 1920, Baume & Mercier manufactured the most stamped timepices of all Genevan watch factories. Baume & Mercier products are not only reliable, they are also creative and unique. Watches such as the Marquise (1950), Galaxie (1973), or more recently Catwalk (1994) and Hampton Milleis (1999) were forerunners that marked their time and became a source of inspiration within the watchmaking world. Perfect proportions, harmony and balance are present in all Baume & Mercier creations. So much that in 1964 the brand adopted the symbol of divine proportion, the Greek letter Phi, which is present on all its models. Brilliantly achieving the ideal alchemy between tradition and modernity, today, the company lays claim to a veritable horological legitimacy. Baume & Mercier products have garnered international recognition for their reliability, quality, durability and personality. 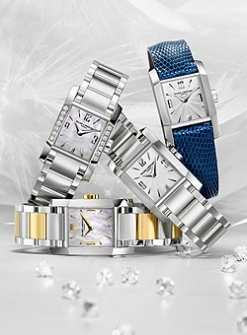 Currently, the company encompasses 20 subsidiaries present in 75 countries, with nearly 170,000 watches sold in 2002. Baume & Mercier prides itself on a strong presence in Europe, notably in Italy, Spain and France. Across the Atlantic, the United States represents 35% of Baume & Mercier sales. Priority for 2002 will be placed on developing the high-potential Asian and Japanese markets. In September 2002, Baume & Mercier inaugurated its own production site, Les Brenets, situated in the Swiss Jura, just a stone's throw of the cradle of its watchmaking origins, the Les Bois village. The brand's vision for the years ahead resides in remaining a "Maison d'horlogerie", manufacturing timepices of highest quality, 100% Swiss made, in combination with a unique design.